One of the technologies that we've been looking forward to becoming more prevalent in iOS accessories is the incorporation of low-power Bluetooth 4.0, now known as Bluetooth Smart. The technology allows for low-power long term connectivity between your iOS devices and your accessories. Kickstarter-backed e-paper Pebble watch was one example that generated an enormous amount of interest with over $10 million in pre-sales. 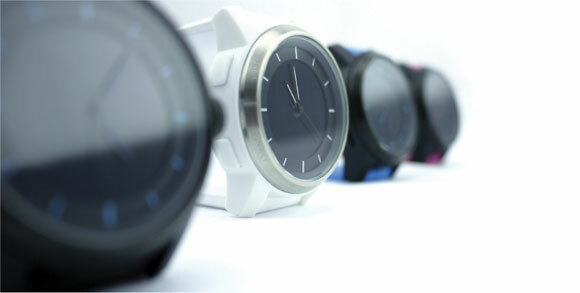 ConnecteDevice today announced the worldwide launch of their COOKOO watch which also begin life as life as a KickStarter project. The company describes the watch as a designer watch that combines analog movement with a connected digital display. By using a freely available app, users can pick and choose which notifications that appear on their watch. It also has a customizable command button which can find your phone, snap a photo, check-in to Facebook or tag your location on a map. The watch uses a standard button-cell battery that will last up to one year. It is scratch resistant and water resistant. COOKOO supports the iPhone 5, iPhone 4S, iPad mini, iPad (4th & 3rd generation), and iPod touch (5th generation). The watch is priced at $129 in 5 different colors. ConnecteDevice says the watch is shipping now and they will be showing it at CES 2013. Based on comments by early Kickstarter backers, it seems there are some dropped-connectivity complaints with the first version of the software that the company says they are addressing in an upcoming update. Am I the only one who doesn't understand why these watches are such a big deal? These so-called smart watches have no appeal to me. They seem like a solution looking for a problem. So you don't have to take your phone out of your pocket, I assume. that video is enough for me to not want this product. who signed off on that music?! This will die a very quick death... on the name alone. Good idea, but the watch is so chunky. Way too chunky. The woman in the first segment of the video looks like she's wearing a lump of brick on her wrist. I'd love to see a nice looking watch with this functionality. This is entirely too much jewelry for grandpa!! I wish Apple would have allowed such functionality on the old Nano. I can see how it might be a cool idea but this looks like you have a big chunk of plastic strapped to your wrist. Not that bad really. Much lower profile and classier than some of the Fossil hipster watches I see around. The steel version is even nicer. Don't have a pic of it yet. Here you go.. Wearing it now..